WANT TO KNOW WHAT MY CLASSES FEEL LIKE? Learn achievable and inspiring techniques to nurture your creative wellbeing, via a unique fusion of paint, drawing, collage, nature, mindfulness and more. Intuitive Art is a gentle approach to creativity using our feelings, imagination and wellbeing as inspiration. 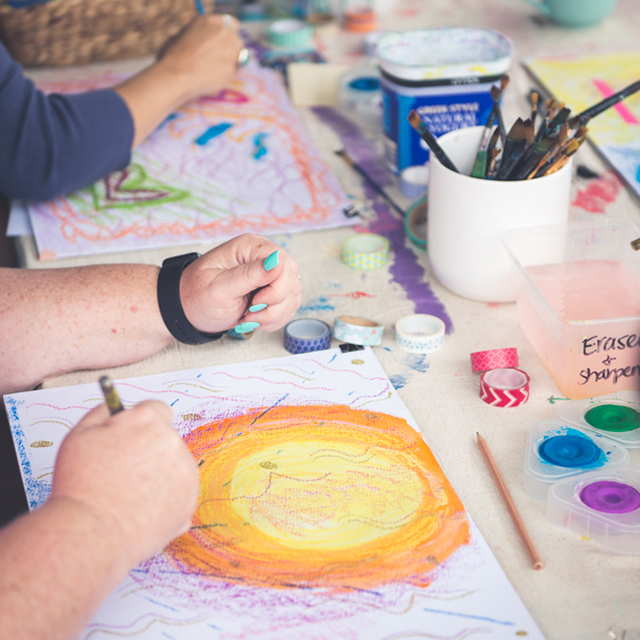 Imagine feeling guided with gentle music as we explore mixed-media materials and mindfulness in a relaxed indoor-outdoor Intuitive Art Studio on my back verandah. All materials are provided and each class features a small community of 6-8 students. It's a beautiful, playful experience with a focus on enjoying the process - there's no such thing as mistakes here! All classes are based at my homely Intuitive Art Studio in Clontarf, Queensland.
" Attending one of Chrissy’s Intuitive Wisdom classes is a divine pleasure. 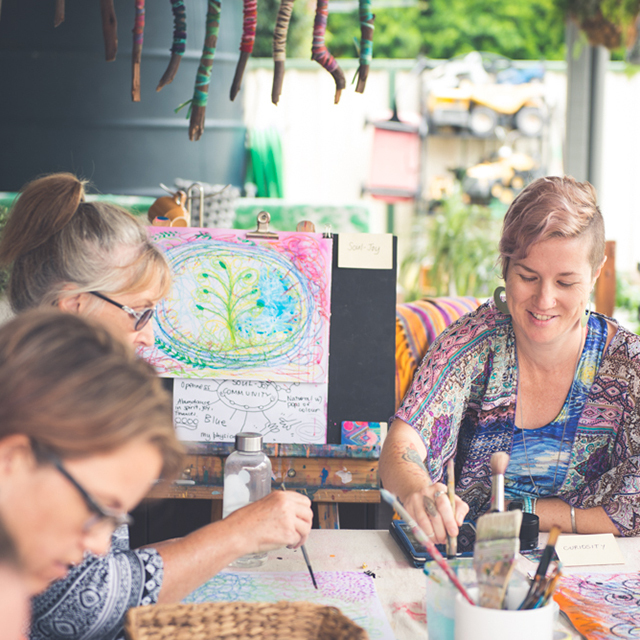 It starts with being welcomed into a beautiful, organic space and flows through to the nurturing teaching style where participants are encouraged to release, and ultimately embrace, the inner artist that lurks within us all. The beautiful soul that you see emanating from Chrissy’s works shimmers in person and three hours spent learning and creating in her presence left me blissful. " - Karenlee Thompson ~ Author + Massage Therapist. No one could prepare me for the transformation I have experienced after completing a beautiful weekend of art making with Chrissy. I signed up for the course in an attempt to add more creativity to my current lifestyle. I ended the retreat not only reaching these goals but also completely reframing the way I perceive and believe in my own art making and artistic expression. Chrissy's approach is second to none. She is able to use her creativity and to empower the spirit and fulfill the heart in a way that is completely unique. I cannot wait to create art with her again in the near future. I would like to share with you from the participants perspective how blessed I feel for having been part of your online class. I have done many online e-courses living in a remote rural Victoria; it's my little outlet as an artist to break myself out of a rut that we can get into as artists. Your e-course was/is THE BEST that I have ever participated in. Your presentation of the course is the most professional I have ever been involved in. Your video tutorials, pdf files and social media use were second to none, the best I have been involved in. Through it all, your personal connection made me feel like I was sitting in a room creating with my best friend. 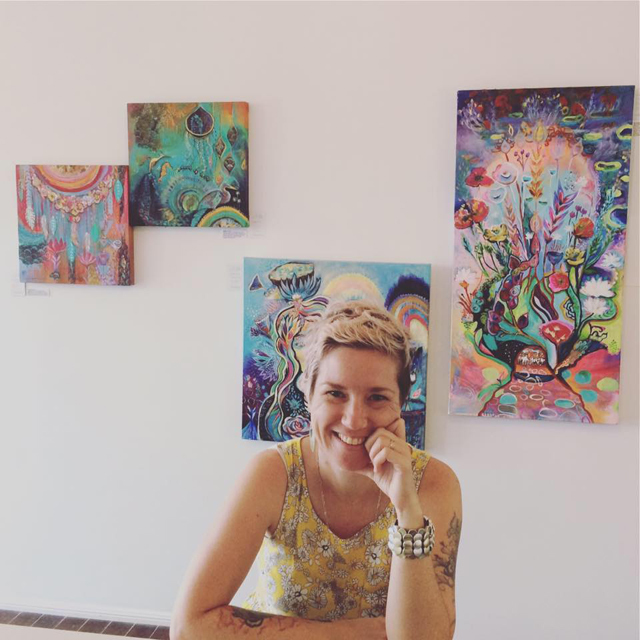 Chrissy's workshop gave me the space and confidence to explore my own unique sense of artistic and emotional creativity. Having always felt a connection with artistic mediums, I was held back by the belief that the artwork I produced was just not very good. Chrissy helped me shed the weights of self-doubt and fear of not meeting preconceived ideas around what art should look like.